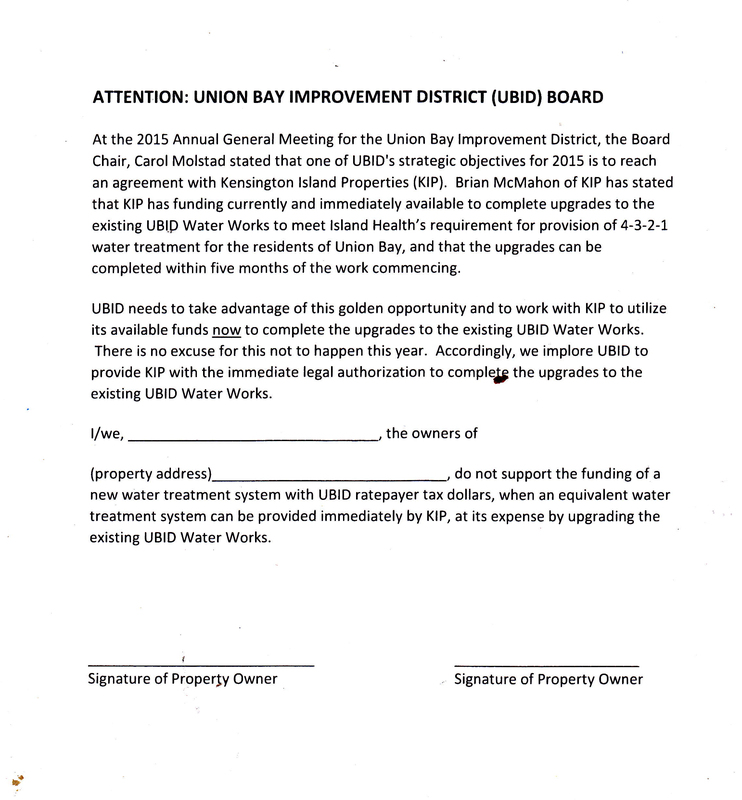 Union Bay Improvement District Trustees in a Conflict of Interest? ADVANCE POLL APRIL 11, UNION BAY IMPROVEMENT DISTRICT OFFICE 9 A.M. TO 6 PM. 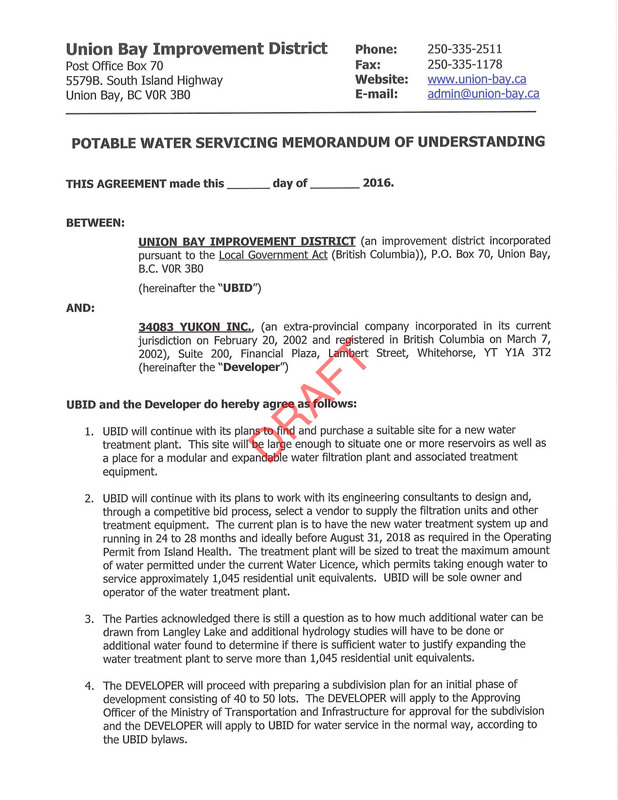 In a nutshell, two years ago (2015) Glenn Loxam, Peter Jacques along with David Godfrey circulated a petition obtaining signatures supporting granting Kensington Island Properties aka 34083 Yukon Inc. an extension to the 2011 Water Infrastructure Agreement that expired Dec. 31, 2014. It is unclear why these three believed this would be an acceptable legal action for the Union Bay Improvement District to initiate. Loxam, Jacques and Godfrey had a meeting with Minister Peter Fassbender and presented their petition. The minister appointed a Facilitator, Jim Mattison, to get the parties back to the table – he is not a negotiator. This audio clip is from March 14, 2016, Public Meeting hosted by Kensington Island Properties aka 34083 Yukon Inc. Peter Jacques states his name and talks about a piece of land Kip is offering. Someone asks what piece of land and McMahon responds but does not indicate the location of the piece of property or the size. 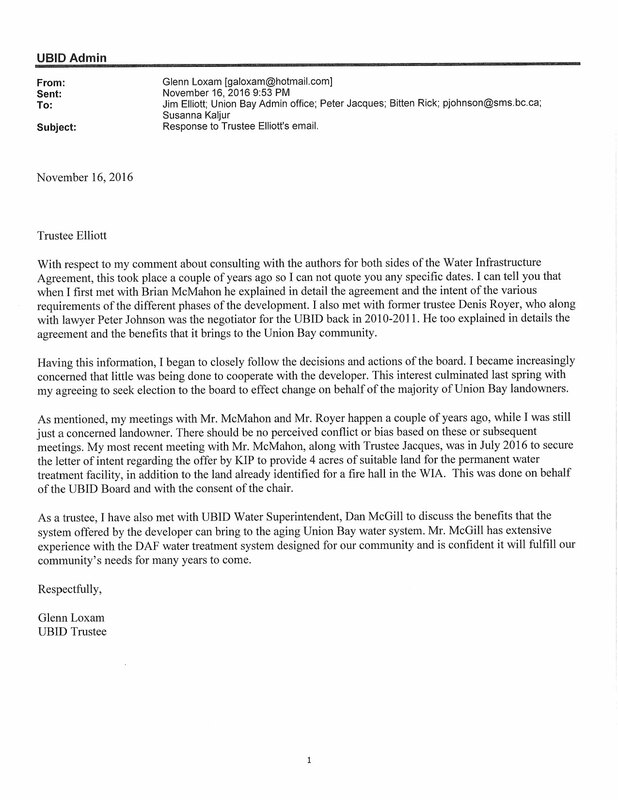 I also don’t believe KIP ever offered a piece of land for the permanent treatment facility to any previous board as there was never any land suitable within the KIP development for a water treatment facility and McMahon knows it. Let’s see the documents. This video clip is from the March 16, 2016 UBID monthly meeting with Peter Jacques bringing the meeting to a halt and again mentions the piece of land KIP is offering free of charge. The problem with the above statement is that the developer never provided any details about the piece of land to the public so it’s obvious Peter Jacques and Glenn Loxam were both negotiating/meeting with Brian McMahon and making deals before they were elected in April 2016, in order to make this statement Mar. 22, 2016.. And the agreement they negotiated on June 7, 2016 confirms what was stated in their document of March 22, 2016. The developer never made any of these facts public. The two were elected in April 2016. You will note above they mention Mr. Mattison. 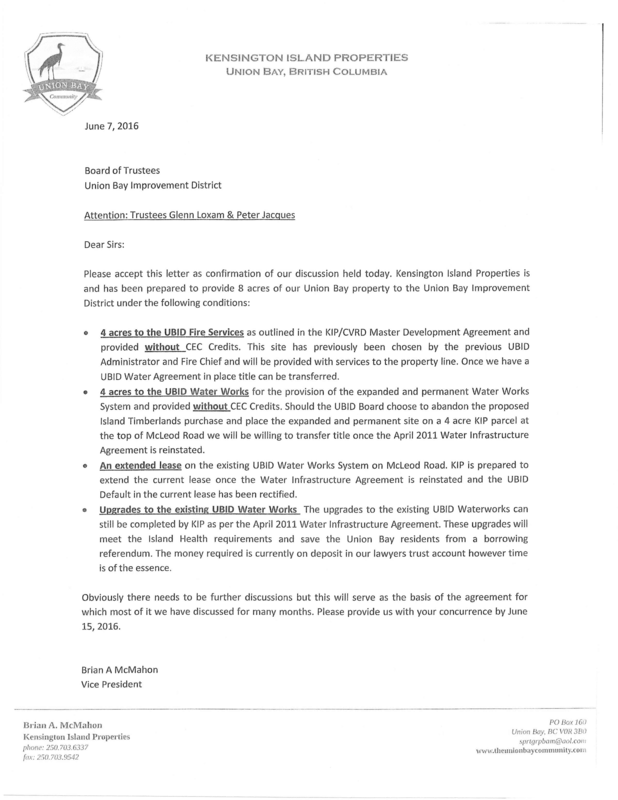 June 6,2016, a Memorandum of Understanding was reached by the Facilitator Jim Mattison, Brian McMahon, VP of Kensington Island Properties and Union Bay Improvement District Administrator Kevin Douville. The following is dated June 6, 2016 on the UBID website. 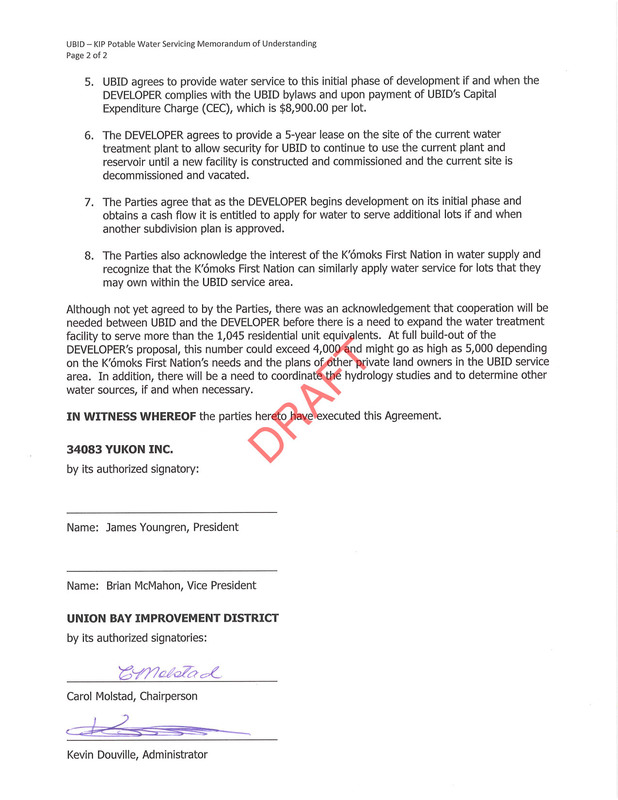 The very next day Trustees Glenn Loxam and Peter Jacques met with Brian McMahon, VP of Kensington Island Properties aka 34083 Yukon Inc. without the authorization of the Board of Trustees and negotiated the following unsigned agreement and presented it to the Board. Please note the last paragraph which states: Obviously there needs to be further discussions but this will serve as the basis of the agreement for which most of it we have discussed for many months.” The document is dated June 7, 2016, and they have discussed most of it for many months? Glenn Loxam and Peter Jacques were elected and took their oath April 13, 2016, so when did they have the previous discussions? April 13, to June 7 is barely eight weeks or two months but not “many months”. Loxam claims it was a couple of years ago that he spoke to Brian McMahon. Did he forget all the meetings in the spring of 2016? Three great Trustees resigned as a result. Trustee Jim Elliott raised concerns over Conflict of Interest because of the rogue actions by these two trustees. 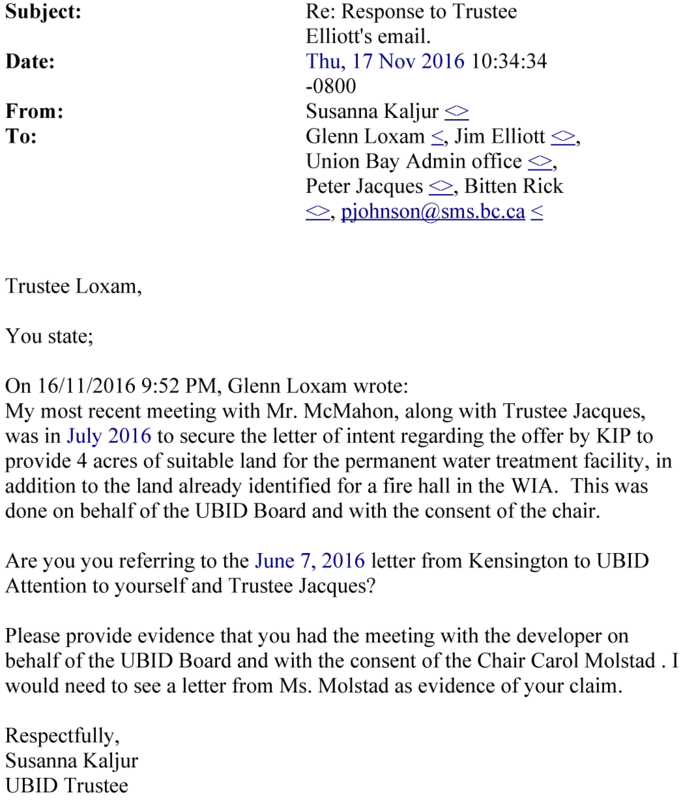 Finally, the correspondence sent to trustee Elliott from trustee Glenn Loxam has been published on UBID’s website in the revised draft of the December 2016 Meeting Minutes. 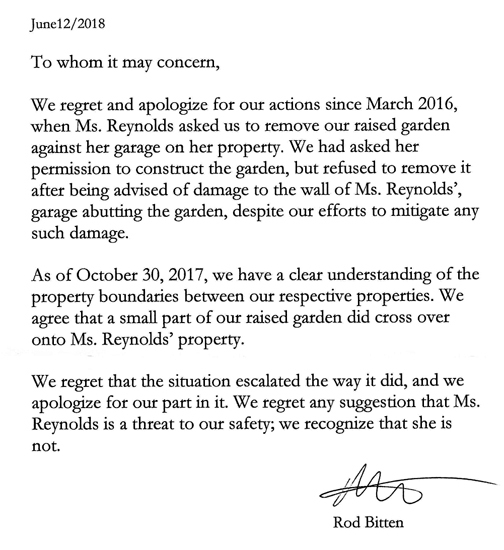 The third paragraph, last sentence: “This was done on behalf of the UBID Board and with the consent of the chair.” This is completely false. There is absolutely no evidence anywhere supporting this ridiculous claim as his defence regarding the conflict issue. This was a CONFLICT OF INTEREST by both Peter Jacques and Glenn Loxam. To top it off – he cc’d UBID’s lawyer Peter Johnson – now he has the evidence. 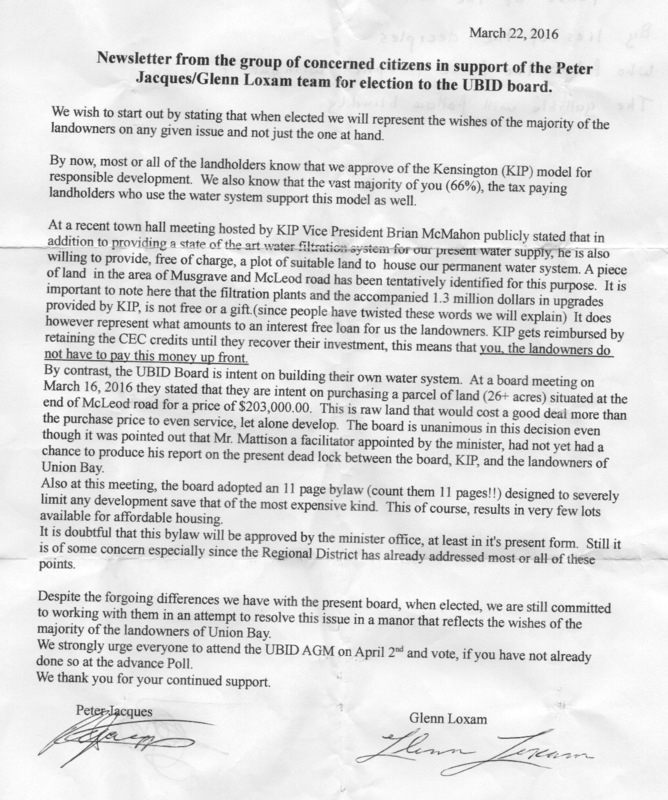 This was a blatant CONFLICT OF INTEREST and trustees Glenn Loxam and Peter Jacques must recuse themselves from any matters involving Kensington Island Properties and the Union Bay Improvement District. Next Post What Caused Union Bay to be in This Situation?